Find hotel near Theater Der Schatten Or N ..
Theater der Schatten is an art theatre depicting the history of the city of Bamberg in 90 minutes. During the show Norbert Gotz narrates the history of the city in a powerful voice enough to leave you with Goosebumps. The 90 minutes at the theatre are sure to leave you entertained. 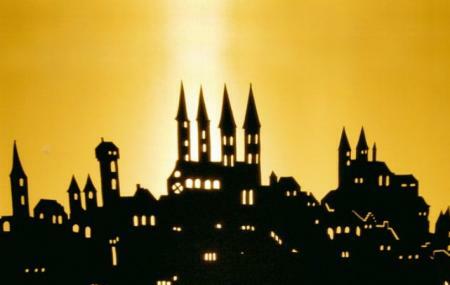 The theatre does not screen the history in the form of films or opera but as a unique shadow theatre. A visit to the theatre would indeed be extremely informative with a comfortable experience. The play is not advised for kids below the age of 10. How popular is Theater Der Schatten Or Norbert Gotz? People normally club together St Michael's Monastery and Fränkisches Brauereimuseum while planning their visit to Theater Der Schatten Or Norbert Gotz. wow - really nice event/theatre on the history of the city in the old Hofhaltung. I have been living in Bamberg for some years now and I still could discover new aspects! I really appreciated the level of sophistication and engagement of the presentation (the requisites and the "lecturer"). Absolutely Recommendable. Sehr empfehlenswert! Informativ und unterhaltsam. Ausgewogen, abwechselnd ernst und humorvoll, wurden wir durch 1000 Jahre bamberger Geschichte geführt. Die Licht- und Schattenbilder fand ich absolut genial gemacht. Eine Stadtführung am vorhergehenden Tag mitzumachen war für uns eine prima Ergänzung. Einfach nur Genial! Ein MUSS, wenn man die Stadt besucht! Pittoresco ed interessante ascoltarne la Valenza storica dalla guida locale.